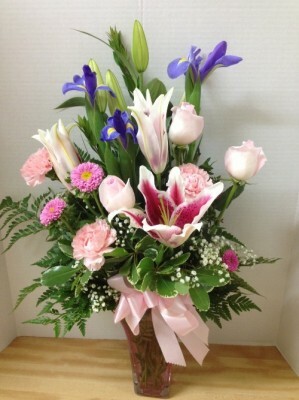 Home → Flower Shop → Pink! 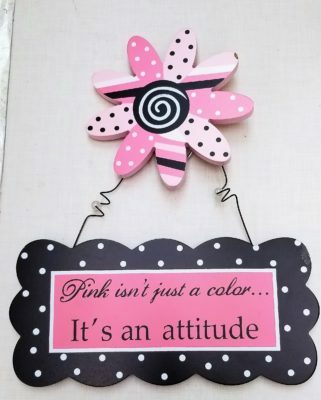 You’d be surprised how many people call us and say PINK is her favorite color! That always makes me smile, because it’s MY favorite color, too! And it was Pamela’s mother’s favorite color. It’s a soft, romantic color that’s can be refreshing, happy, and a great accent to other colors (like yellow, lavender, purple and red). It took me a while to like red and pink together, but now I love them! Do you? 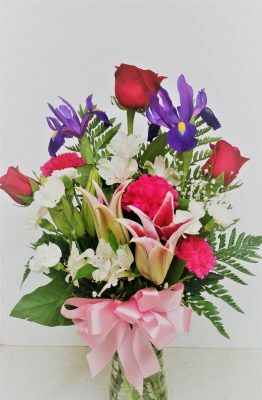 You give me the opportunity to post some of our pink floral arrangements and I’ll jump on the chance! I hope you like them! This one’s called Passion Pink. 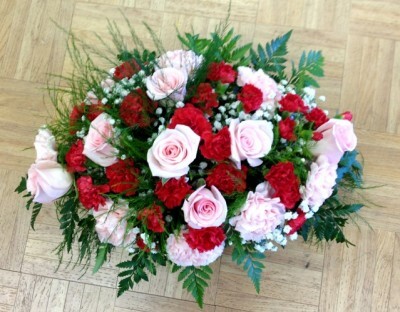 Roses, Gerbera Daisies and Lilies are tastefully designed in a cube or bowl, and yes, we deliver! The other one is Brighten the Pink (I love the yellow with it!) It’s one of our Top Sellers! 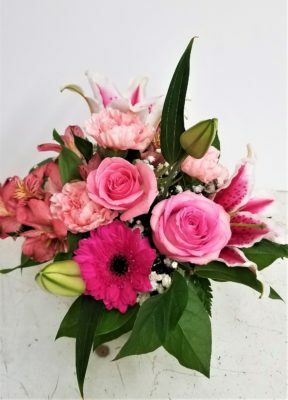 Our A La Pink Arrangement is one of my favorites! 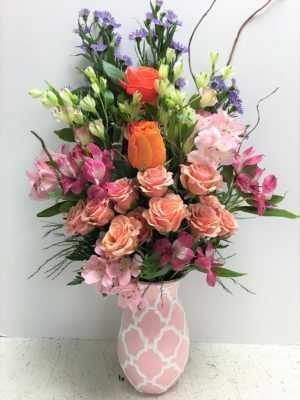 We use bright flowers such as orange roses to make this arrangement POP! You’ll find it’s one of your favorites, too! 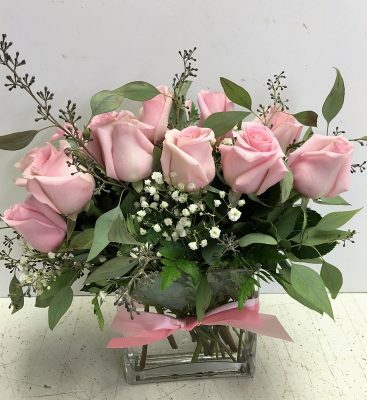 There’s nothing quite like Stunning Pink Roses or Contemporary Pink Roses. The shades vary, from light baby pink to a bright, stunning hot pink! Nature creates them and Pamela designs them just for you! You’ll notice on our website the Stunning Beauty is my favorite design. I love the look of the red roses with the Stargazer Lilies. It’s romantic and perfect for an anniversary or any occasion where you’d like to say I Love You. I also design a PINK Stunning Beauty, a bit softer but equally romantic. This is perfect for mom or your girlfriend. As I mentioned, I had quite a time accepting red and pink together. But WHOLA! Here’s a centerpiece I designed that marries the 2 colors beautifully! Do you agree? I would be quite remiss if I didn’t mention babies. Of course we can design these gifts in blue, but today we’re concentrating on Pink, right? Here’s the Baby Cube Basket and a Plant for Baby. I think Baby’s First Rubber Ducky is adorable! 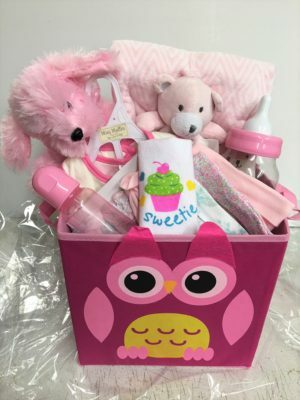 You’ll find many more options on our Baby section of our website! I hope you’ve enjoyed this Pink tour as much as I’ve enjoying writing it for you! 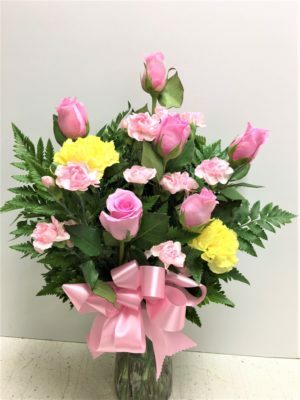 Using pink as a focal point or accent color will ensure the floral arrangement we create for you is PERFECT!